Vice President Mike Pence is holding 11 campaign events in 9 different states over the final 6 days before the midterm elections, per a copy of his schedule obtained by Axios. Why it matters: His schedule, detailed below, shows he's focused on high-profile Senate and gubernatorial races — with less attention on the House. That's consistent with what top operatives have told Axios: They expect the House to flip to Democrats and Republicans to gain seats in the Senate. Oct. 31: Mansfield, Ohio, for Rep. Troy Balderson, Senate candidate Jim Renacci, gubernatorial candidate Mike DeWine, and Rep. Bob Gibbs. Nov. 1: Dalton, August and Savannah — all in Georgia, and all for Brian Kemp's gubernatorial bid. Nov. 2: Kansas City, Missouri, for Senate candidate Josh Hawley, gubernatorial candidate Kris Kobach, Vicky Hartzler (MO-04), Kevin Yoder (KS-03), Steve Watkins (KS-02) and Sam Graves (MO-6). He's also going to Indianapolis, Indiana, for Senate candidate Mike Braun and Greg Pence for House. Nov. 3: Pensacola, Florida, for Senate candidate Rick Scott and gubernatorial candidate Ron DeSantis, and Hudson, Wisconsin, for gubernatorial candidate Scott Walker and Senate candidate Leah Vukmir. Nov. 4: Chattanooga, Tennessee, for Senate candidate Marsha Blackburn. Nov. 5: Kalispell, Montana, for Senate candidate Matt Rosendale, and an additional stop in a different state could happen, based on internal White House planning. 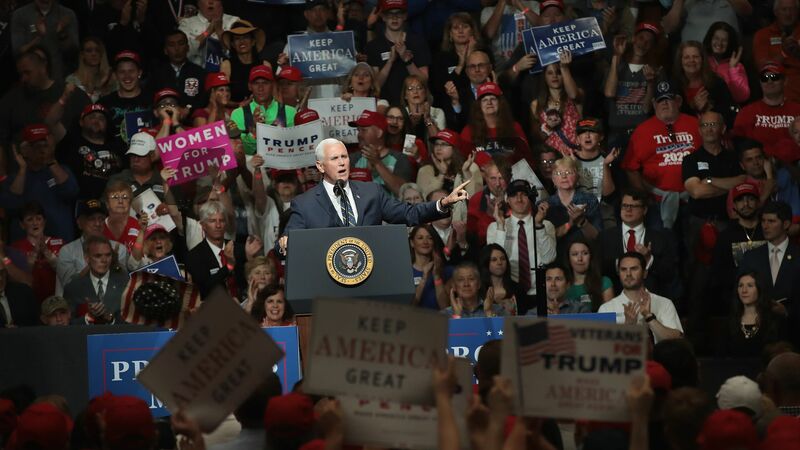 Between the lines: Pence will join Trump at his midterm rallies in Indiana, Florida and Tennessee. But the two will divide and conquer on the eve of the election, with Pence ending his midterm rally blitz in Montana — one of the most hotly contested Senate seats, with Matt Rosendale facing Democratic Sen. Jon Tester. What they're saying: "The Vice President will be supporting Senate, House and down ballot Republicans throughout his travel this week, weekend, and next week," said Alyssa Farah, a spokeswoman for Pence. The other side: While Trump and Pence are helping in races for Senate and governor, Donald Trump Jr. is hitting the campaign trail for various House candidates in the Midwest in the final days before the election. Update: When Axios approached the VP's office and provided visibility of the schedule we were about to publish, they only provided Troy Balderson as an example of a House candidate Pence was campaigning for. After this story was published, the VP's office provided us additional House candidates and we have updated the story accordingly.